I worship God with every one of them, in whatever form they worship Him. I shall enter the Buddhistic temple, where I shall take refuge in Buddha and in his Law. May He who is the Brahman of the Hindus, the Ahura-Mazda of the Zoroastrians, the Buddha of the Buddhists, the Jehovah of the Jews, the Father in Heaven of the Christians, give strength to you to carry out your noble idea! Many thanks for your kind visit! Hope you enjoyed reading the posts. If you are happy or else also, why don’t you please leave a comment on the relevant Post? That would be a good guide for me. Again thanks for your patience…May the blessings of the Holy Trio be with you all ! I was thrilled to go through some of your articles and pictures. It is amazing to see how Thakur’s grace is flowing all over the world! I also looked at your Picasa albums from Ranchi and after many years (20?) saw pictures of Sukumar Maharaj (Somedevanandaji). I am born and brought up in Ranchi and so Dungri Ashram has a very special place in my heart. I will let my father (Murari Mohan Chatterjee) know of the wonderful blog you have made available as he talks about many fond memories of your days in Ranchi. Thanks again for keeping such a wonderful blog of all the events. 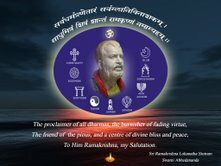 We get a glimpse of ‘global Ramakrishna family’ and message of hope amongst the chaos of today’s world around us. This is just to wish Maharaj a Happy Sri Ganesh Chaturthi and may Lord Ganesha bestow on Maharaj all of His choicest blessings. We were thrilled to listen to the hymn, sung by M S Subbulakshmi ! Thank you for your kind sentiments! Yes, M S Subbulakshmi’s voice is heavenly. May you and your family be blessed with peace, happiness and Spiritual Prosperity! Very happy to see your new post about pets. The love that we get from our pets, their faithfulness and dedication is an illustration of true, unalloyed love. Truly, the divine manisfests through all forms, pervades all and makes itself expressive in all forms of existence. Obeisances to the Holy Trinity, Swamiji Maharaj, Swami Saradaprabhanandaji Maharaj and Pravarajika Ishtaprana Mataji and Pravrajika Divyanandaprana Mataji. Many of us are blessed to be able to go to the holy places in India that are associated with Sri Ramakrishna. There are also those who, for reasons only known to Sri Ramakrishna, are not able to do so. But for the devotees of the Ladysmith branch, the trip to the Durban ashrams can be equated with visiting the places where Sri Ramakrishna placed his Holy Feet. Each of the three centres we visited was unique, but the common element running through them all was the love with which we were received. We were treated to delicious food at each of the centres (to the point I was certain I would not need to eat for a week afterwards!). The ever watchful voluntary devotee-waiters ensured that our plates were always full. All we had to do was to effortlessly open our eager mouths to enjoy the delectable delights that were especially prepared for us – and that we readily did. It made me introspect about whether we are equally receptive to the spiritual treats that are graciously offered by Swamiji Maharaj, Swami Saradaprabhanandaji Maharaj, and our Matajis. Do we as readily open our minds, hearts and souls to this kind of nourishment that are always forthcoming from these Blessed Sources? I pray that Swamiji Maharaj blesses us with the power of being open to the instructions and teachings which are readily imparted to us. I am glad to mention that he responded to our mail, and thank you. All your blog topics are really wonderful. Welcome to this blog and thanks for your visit! May you be filled with Vedantic thoughts! We haven’t been receiving your fruitful blog for some time and are missing the valuable information you are sharing with us. My hearty greetings to every one of you including your pets. My sincere apologies for keeping the blog stranded! From today I hope to keep my blog updated. Please do visit from time to time. Gurupoornima message from your blog moved me very much. I went on telling even Swamiis of our different centres about it and every one felt His Presence. I went to Belur Math in mid-September and stood near Swamiji’s room and visualised what your Guruji told you in 1976. It was a revelation. Now I am at Madurai with Swami Kamalatmanandaji (Dayal Maharaj) and Swami Rajeshananda (Ishwar Maharaj) whom you know. Our Muthukumar Maharaj of Batticola was unwell and was in Apollo Hospital, Chennai. I Visited him recently. It is sheer grace of Thakur that people like this blog. Happy to note that you are now staying in Madurai. Who is helping brother Vimurtananda in Sri Ramakrishna Vijayam? How is Muthukumar Maharaj? Has he been discharged from the hospital. Please keep me informed. May you always accord our Divine Mother with your heart’s devotion, then you will be assured of Her everflowing Grace. I was very busy in the 3rd phase of ‘Future Leader Discovery Contest’ arranged by our Delhi Mission and missed your blog. Now it’s over and again I want to be near you through your blog. Kindly send me the link so that I can access the blog directly. Hope you remember me, I met you at the time of ‘World meet for peace and harmony’ at our Delhi Mission. Shubho bijoya! Thanks for your visit to this blog! Nice to know that you take keen interest in our activities conducted by our Delhi centre. yes, Karma done in the spirit of yoga is a sure step in one’s emancipation. All our ashrams provide such facilities to our devotees who must take advantage of that. I am glad that you do so. And oh yes, I do remember you and other devotees whom I met during my recent pilgrimage to India. Through the grace of the Holy Mother and Thakur, I pray all is well with the transition and that the body and mind are in good health. I think is far easier for a Monk to keep the later faculties in check than it would be for a house-holder. Nonetheless, it is His grace alone that gives us the privilege to worship, meditate, acquire just enough material wealth and then leave this earth gracefully, hopefully never to return to human birth again.